The flyover from 281 to 1604 makes Stone Oak much more accessible to downtowners, but after inching up Stone Oak Parkway, we still needed a drink. Luckily, Copa offered the perfect reward. A warm faux Tuscan interior, friendly staff, and neighborhood vibe makes Copa a worthy destination. Wines by the glass are moderately priced (most between $7 and $11) but the flights are the best value. We sampled the Vino Diavolo flight, four glasses of spicy Italian reds, for $18. No pinche shots of wine here — a good strong pour of each set us for the evening. 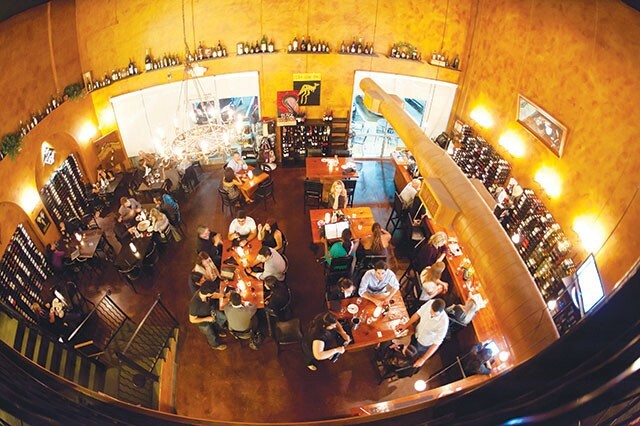 Consider augmenting your wine swilling with selections from Copa’s tasty menu — tapas, pommes frites with a rotating list of exotic sauces, a choose-your-own cheese plate, and a selection of pizzas offered either thin crust-style or on lavash flatbread. We started with the classic pepperoni Parma, half-price during happy hour, but ended with the signature Romagna flatbread — mozzarella, spinach, prosciutto and lemon sauce— mangia!